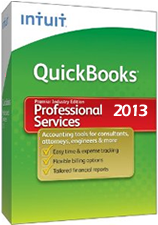 Quickbooks Professional Services 2013 is a very efficient product to control and manage a small business. You will find everything here that is necessary to carry out the most important and essential business functions. Easily set up your company, create quotes and invoices, and make and receive payments. At the end of a month pay your employees either by check or direct deposit and make appropriate tax payment directly from QuickBooks 2013. Customer and Vendor center are places to keep all important information related to them. Studying your company’s performance is easier with several built-in reports. Additionally you can prepare custom reports that fit your company’s needs. If you like, you can share those reports with other QuickBooks users through Live Community where business and software issues are discussed. You can also search for and download the reports that other users posted, follow blogs, find answers to common challenges, and learn about business and QuickBooks through videos and articles. Aanalyze balance sheet by class – beneficial to companies that operate in different geographical areas or market segments; your company balance sheet is expressed in total numbers and broken down by classes which helps to pinpoint the strongest and weakest areas of your business. Invoice for Time & Expenses brings up the screen with customers where you decide whom to bill and for what; assign time, expenses, mileage, or items to appropriate customer and QuickBooks will create an invoice. Any unbilled expenses such as Time or other items can be transferred to invoices and sent to the customer receiving the service. You can bill your clients depending on who provides the service; hourly fee can differ between the employees, type of service provided, and even the clients who receive it; this allows for greater flexibility is establishing price levels and accurately preparing invoices. Profitability report shows each client and every project you made for them and how profitable you were; compare the total numbers and for individual job. Make sure you get paid for all products and services offered – pull up a list of all the current projects and what is still pending to be billed.